In today’s modern day and age, printers are a dime a dozen, and they come in all sorts of different shapes, sizes, and advanced features. With trendy and modern colors and sleek new designs, printers aren’t lacking in the innovation department. There are many different types of printers in the market which fit into a broad array of different budgets. Whether you’re looking for a commercial printer that can handle large-scale volume printing or a personal printer for your home and office use, this guide covers all the information you need in order to make the best possible decision. The most common questions we get regarding printers are which printer is right for me? Whether you’re a digital photographer or writer, printers are constantly being designed with new technology in order to accommodate new needs. In order to choose the right printer, there are numerous different factors that you need to take into consideration and the most important thing you need to figure out is what use you’re trying to get out of a printer. Some printers are focused explicitly towards printing digital photography on higher quality premium paper. Other printers are designed to print a vast array of different colors and spectrums for digital artists. You have your basic printers that can handle simple tasks and requirements for families and students as well has high tech business printers that can handle and process thousands of sheets per day. Printers also come in different shapes and sizes, so take into account your office or desk space when considering which type of printer you would like to purchase. New modern printers come in sleek designs and sizes that take up a minimal amount of space on your desk, but these come at a premium cost. Conversely, you can still find older printers that don’t look as aesthetically pleasing but come at a much more affordable price. Weight is also another factor to consider when selecting a printer. Some printers are much heavier than others, and this needs to be taken into account when deciding which printer to buy for your home. Some printers are lightweight and easy to move around as well as easy to use for the elderly. The heavier printers with more features often weigh much more, thus making transportation and readjustment in the office a bit more cumbersome. Lastly, you need to consider wired or wireless printers.Some printers come with a very small cord that leaves little room for adjustment and placement in the office, and some printers come with a very long cord that needs to be tucked away in a secure place so that you don’t trip. Besides that, it is a personal preference if you want your desk setup to be wireless or you want to use a printer remotely in an office as wireless printers let you connect your computer via Bluetooth making it easy for anyone to get their documents printed out. Printers last quite a long time so making the right investment into this purchase is critical towards buying a printer that will last you many years of service. Printers of cheaper quality and unknown brand don’t last very long, so if you’re looking to find a printer of value that is durable invest in a reliable brand. Buying a new printer isn’t something that you do every day, so take the time to do due diligence, and you will be rewarded with a worthy printer that never lets you down. It is essential that you take all of these factors into consideration when deciding on which type of printer you would like to purchase as printer repair can also be quite expensive. Most people don’t print things every day, so when the time comes that requires a printing task to be completed, you want your printer in tip-top shape and capable of handling the job without any worries or issues. Printing should be an easy, stress-free experience that doesn’t require reading the instruction manual and a headache. With modern technology and newer printers, this has become a reality for many people. Below are some factors to consider when buying a printer. Desk size is a very important aspect to take into account when purchasing a printer. Larger desks are more accommodating and give you more flexibility when it comes to determining which type of printer you should purchase. Smaller desks are much more limited in printer options unless you don’t mind a large printer taking up most of the space on your desk. Printer noise is another factor to take into careful consideration. Some printers are much quieter than others, and if the bustling sound a printer makes when printing is something that you find annoying, purchasing a quiet printer is an option for you. Printer durability is also an important issue to consider. Some printers require a constant change of ink cartridges and part replacements after a few months of use. Other printers can last a very long time without you having to worry about replacing anything or ordering spare parts. Choosing a printer based on its durability is always a wise choice. There are so many different types of printers available currently that it’s sometimes hard to keep up with the latest and greatest trends. With various specialties ranging from photo printers to laser printers to all in one printer, it can be difficult to know which the best option for you is. Below is a list of the various types of printers available and a little bit of information on each one. 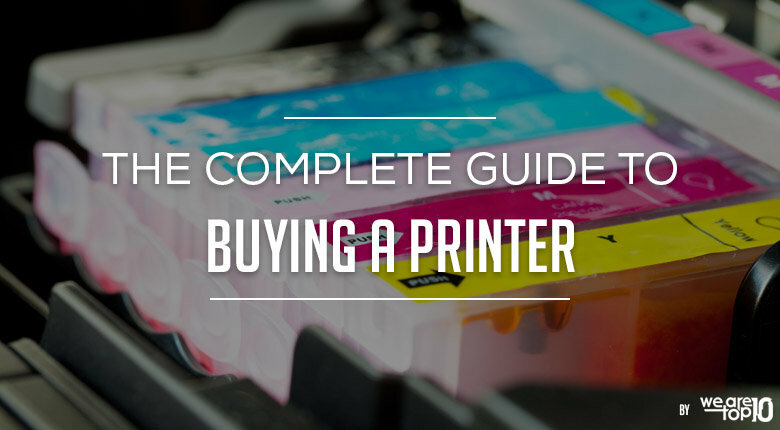 Use this guide to help you make the best decision on which printer is right for you and your needs. These special printers are designed to produce photos, much as the name of the printer makes very clear. However, they are much more intricate and complicated than that. From digital photos to HD photos all the way down the spectrum to 4K photos, these printers have it all to make sure that any of your photography needs are taken care of. Photo printers often require special paper to use, as well as certain software that needs to be installed on your computer that coordinates with your camera as well as with the printer. Altogether, photo printers require multiple different steps to get up and to run properly. This type of printer is best for avid photographers or professionals who have specialized printing needs. Special Ink and design designations to print high-quality photos. Special software to design and edit photos on your computer before you print them. Comes with a special do-it-yourself kit that lets you configure the printer to your liking. A highly specialized printer is great for photographers and professionals who require HD printing needs. Able to produce and print a vast array of different photo options. Lack of flexibility in device size. Many photo printers have to be quite large in order to accommodate larger portrait style photos, thus leaving them on the lower end of the flexibility spectrum. These printers are specifically designed to print photos. They lack the features of other more commonplace printers should you require normal documents or other things to be printed. These printers are the most commonplace and affordable out of your choice of printing options. They print by spraying ink onto paper and have been around for some time. Ink-jet printers are considered your workhorse printer. They are efficient, reliable, and durable. A good ink-jet printer will last you many years and is something that you can rely on when needing to fulfill normal printing duties. Designed to be your everyday use type of printer, the Ink-Jet printer is designed for common use and standard printing. Uses several tiny nozzles, or jets, to spray the paper with ink and print. Usually can produce anywhere from 100-300 pages before the ink cartridge needs to be replaced. Relatively inexpensive, many different brands have an ink-jet printer, and it comes in multiple shapes and sizes. Ink-Jet printers are easily found and are often given away for free with the purchase of other products. Large and clunky, while inexpensive these printers often take up a lot of space. Limited in features, Ink-Jet printers are basic with simple functionality. LaserJet printers represent a more modern variety of printing machines. These printers use a special electrostatic digital printing procedure. The LaserJet printer produces very high-quality text and graphic printing and is a major upgrade from the Ink-Jet printer. This machine uses a laser beam to print by passing the beam back and forth over the paper and producing clear, detailed fine text. Featuring an advanced higher definition printing process, the LaserJet printer is capable of printing in a fine text with higher graphics. This printer is quieter than an Ink-Jet Printer. With laser technology instead of ink spraying cartridges, the LaserJet printer has more features for added functionality that don’t come with the Ink Jet. The LaserJet printer produces higher quality texts and graphics than the Ink Jet. The laser jet printer is more expensive than the Ink-Jet printer. It is not as flexible with its pricing as most of the LaserJets are on the higher end of the price spectrum. Price Range: Anywhere from $500- $5,000. These printers are exactly how the name states…all in one capable. With the ability to print high-quality photos, clear text and graphics as well as having a laser jet features, these all in one printer don’t come cheap. The all in one printer comes with a multitude of features and functionalities that fit a broad range of printing tasks. All in one printer cover most of your bases, so if you’re looking to do a bit of everything then look no further. Photo printing, digital printing, laser jet printing and highly durable, the all in one printer is the complete package. Features include faxing and photocopying as well as scanning. The software is usually included to help you access these features on your computer. This printer has all of the features that you might ever need with a printer, and then some features that you’ve never even heard of. This printer is the perfect fit for a home office where multiple tasks can be accomplished with one device. If anything goes wrong with a function as a scanner or fax stops working, you’ll need to send the complete unit for service or repair leaving you without anything for your essential needs at home or office. Price Range: Anywhere from $100- $1000. 3D Printers are the latest breed of printing machines which allows you to print our physical 3d objects from digital files. These 3D modeling machines were used in manufacturing and automotive and aerospace industries, but in them, past few years they’ve become highly affordable and are used at a personal level by designers and creative professionals. They use synthetic plastic materials to liquid resins to print out high-quality 3D objects with near accurate precision depending on how expensive or good your printer really is. If you are a creative professional, architect, researcher or just a hobbyist, 3D printers give the flexibility, freedom, and affordability you need to see your ideas transformed into real life.Don’t miss out our Top 10 Best 3D Printer Reviews. Plug-and-Play to sophisticated printers which require calibration for accurate printing. Converts your digital files into physical objects. Portable but well built to withstand high temperature. Comes with dedicated software or can use universal software that allows makers to make digital 3D models which can later be printed out. They are highly affordable compared to the commercial used printers making it easy for anyone to start using them. The materials are easily available online, and unlike regular printers, the refills don’t cost the same as the printer itself. They can print as low as 0.1 mm which means you can get crazy details with them. They are not for everyone and do have a learning curve, even though there are marketplaces with pre-made digital 3D files but to make one yourself does require some legwork. As they are new, if anything goes wrong chances are you’ll have to get a new 3D printer. The printers don’t work at 100% accuracy, and often the prints fail. Price Range: Anywhere from $50- $4000. Weight Range: 1.2 – 100 pounds. In order to figure out what kind of printer is best for you, the best thing to do would be to analyze your needs. Do you need a printer for business or personal reasons? Do you like taking photos? Do you find yourself needing to print often? Based on the amount of work you could feasibly see yourself using a printer for, purchase the printer that is best for your requirements. Which printer is best Ink Jet or LaserJet? While there is not a drastic and huge difference, the difference is in the mechanism with which an Ink Jet and LaserJet printer printers out documents. If affordability and basic use is your goal, go with the Ink Jet. If you are seeking high definition clarity in your text and graphics and don’t mind spending a little more for those things, go with the LaserJet. The basic inkjet printers are best for home use as they are very affordable and cheap and you can get them for as low as $50, and they can last a long time before you can discard and buy another one or simply replace the ink cartridges. However, if you are looking for higher quality prints then it’s best to go for a laser jet printers which also don’t break the bank, and you can get a lot of copies out of them before you have to replace the ink. Which printer is most economical for ink? If you want to save on ink costs, then look at printers that are capable of using CISS (Continuous Ink System) as they are the most economical of all. Epson and Brother printers have the best performing economic printers, but HP and Canon are also good options and have improved a lot over the years.